Cardboard*Con is the world's most affordable science fiction / fantasy convention, and the first dedicated to the art of cardboard costuming. Accidentally founded in 2010 by Captain Drew of the original cardboard troopers, Cardboard*Con has gone on to attract tens of devoted attendees and such guests as Cardboard Pac-Man, Cardboard She-Ra, Cardboard Murder Kroger, Cardboard Captain America, Cardboard AWESOM-O, and Cardboard Boxxa Fett(ucinni). First time attendees are not required to wear costumes, but once exposed to the high stakes world of cardboard design they typically ease out the back door and begin running away, quickly. Nerds who are incapable of running away simply nip off to the food court to rustle up a box to put over their head. The con provides a positive economic and spiritual uplift to the city, bringing smiles and laughter to a world deserving happiness. Cardboard*Con is more efficient than any other science fiction convention held in Atlanta, as it eschews the outdated and inefficient "volunteer system" in favor of the "you're in charge of yourself" system. 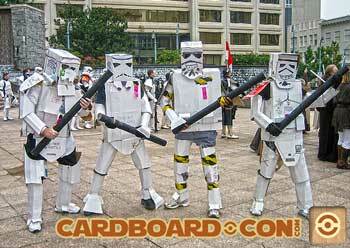 Cardboard*Con happens every year on the First Day of March. Held annually in historic Downtown Atlanta, Cardboard*Con is a family-friendly "traveling convention" spanning several of the city's most luxurious convention hotels and providing a significant positive economic and spiritual uplift to the city as a whole. A map of the convention is provided below for the use of attendees and the edification of the curious. You may have to remove your costume to access this feature. Cardboard*Con is ABSOLUTELY FREE. Group discounts are available. Eternal Memberships are available for $1200 and include access to all areas of the convention as well as exclusive con-related events throughout the year. Yes! Note that the convention is generally held within a few hours of bedtime, but that's your business, Charlie. It's no seekrit that vendors are incredibly interested in connecting with the well-attired attendees of Cardboard*Con! Unfortunately, due to the mobile nature of our key events we do not have a traditional dealer's room. Instead, vendors should attend wearing costumes which incorporate (or feature samples) of the wares they vend. While this is understandably somewhat of a burden, it makes every sale that much more sweet. Please police your own loading dock. It has been said that "There is no such thing as a bad costume at Cardboard*Con", an assertion that has been proven wrong on multiple occasions. You still have TIME to come play! Midnight - 1:30am - Winner's Box : Exclusive After Party at Metro Diner. † - at Cardboard*Con no schedule is ever "final". †† - by "parade" we mean an orderly procession across the street, through the Hyatt, into the Marriott. Please hold hands when crossing streets. Try to avoid blocking traffic and be EXTRA polite to the poor people who do not know what Cardboard*Con is because their first instinct may be to put you into a dumpster (which we all know is the best place in the world).